One of only two artists to win an Emmy, Grammy, Oscar, Tony, and Peabody award, Barbra Streisand, the American singer, songwriter, actress, and filmmaker is, to put it bluntly, an icon of entertainment. In a classic rags-to-riches tale, Streisand slogged her way to the top, first singing in nightclubs, then performing on broadway, making television appearances, and finally starring in films. Never letting go of her dream to be a great actor, Barbra Streisand’s success as a singer was her initial claim to fame but not her only talent by far. 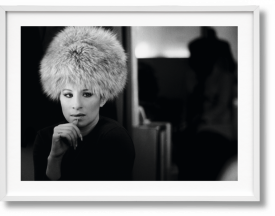 With 50 studio albums to her name Streisand is one of the best-selling music artists of all time. She successfully transitioned from the stage to the silver screen, and many of her great albums, mostly produced by Columbia Records, are film or musical soundtracks. Her Barbra-from-Brooklyn voice with its nasal timbre and Jewish character is unmistakable. And while she sounds without a doubt like a great pop singer, a complex operatic tremor adds rich texture to her songs. With hits like Don’t Rain On my Parade and Happy Days Are Here Again, she made platinum time and again and her concerts and tours remain sell out events. 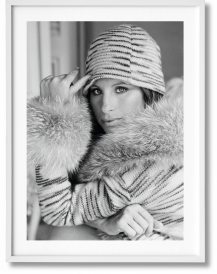 In TASCHEN’s deluxe Streisand publication, images of the celebrity by Steve Schapiro and Lawrence Schiller come together in an ode to her illustrious career. 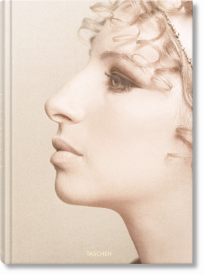 The book features photographs on set and behind the scenes of movies such as Funny Girl, On a Clear Day You Can See Forever, The Way We Were, The Owl and the Pussycat, Up the Sandbox, Funny Lady, Yentl, and A Star Is Born. Stories of her life and lovers are woven throughout. Available in an XXL format and with a photographic art edition, the book captures the elusive yet enigmatic spirit of a performer who can write, produce, direct, and star in almost anything.